Are You Making This COBRA Software Mistake During Open Enrollment? Every year during open enrollment a few unsuspecting companies make a big HR mistake: They unwittingly allow their COBRA administration program to change along with their benefits plans. Sometimes it’s because the carrier recommends a different COBRA administrator. 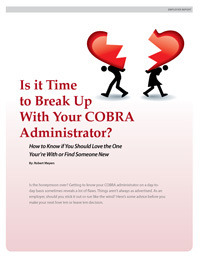 Sometimes it’s because a broker is offering free COBRA software. And sometimes, the broker and the HR team aren’t even conscious that the change is occurring because the COBRA administration was a free service provided by the old health insurance carrier.